In September 2015, I packed my notebooks, pencils, and my most Alice-in-Wonderlandesque dress into a suitcase and headed for Cambridge, England. All around the world, exciting events were taking place to celebrate the 150th Anniversary of one of the best loved books of all time – Lewis Carroll’s Alice in Wonderland – and I was headed to take part in one of the most anticipated events of all: a three day academic conference held in the beautiful grounds of Homerton College at The University of Cambridge. Many of the best names in the field were also heading there, and I was delighted to present my own research among such esteemed scholars and experts on Alice and Victorian Literature, as well as immerse myself for three days in all things Alice. This was one of the most wonderful academic experiences of my career to date, and I loved spending the days engaged in fascinating presentations and tea-break conversations with a wealth of different scholars, many of whom also became friends. Delivering my paper at the ‘Alice Through the Ages’ Conference at Homerton College, Cambridge, 2015. 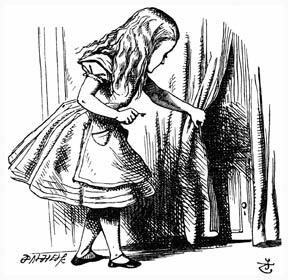 My research paper was entitled ‘”A Book of Rules for Shutting People Up Like Telescopes”: Alice, Dreams, and the Victorian Spatial Imagination’. This research was largely taken from my 2013 PhD thesis, and it was lovely to be able to return in detail to Carroll’s texts, and the wealth of research and ideas I had compiled about them. When I was researching for my thesis (which looked at the role of space, dreams, concepts of mind and the supernatural in Victorian Literature), I covered such a breadth of writers that in order to keep within the strict word limit for the task, I had to cull large chunks of writing, and poor Carroll was unfortunately among those writers who ended up, for the most part, strewn on the cutting room floor when it came to submit my work. Nevertheless, my research wasn’t wasted, and I was able to present my ideas about Carroll and his use of space and dreams (and particularly non-Euclidean geometry) to a very welcoming and enthusiastic audience, which, I was honoured to note, included among its distinguished members one of the conference’s keynote speakers, Professor Dame Gillian Beer (pictured below), who was very encouraging of my ideas as she spoke to me afterwards. Her own book Alice in Space is forthcoming this year, and I’m eager to see how much her work intersects with mine. The location of the conference was as much of a drawcard as the excellent scholars and presenters. Homerton College was not only extremely friendly and welcoming, but its gorgeous grounds were the perfect environment for embarking on journeys through worlds of wonder and imagination. Beautiful halls decked with long tables were the perfect spot to chat and exchange ideas between presentations, while the gardens outside welcomed conference guests with blooming roses and sun-drenched trees. We’re painting the roses…pink! Beautiful flowers adorn the paths leading up to the Great Hall. The conference was part of Homerton College’s wider ‘Wonderland Week’ celebrations, which included a wonderful tea party, garden croquet, giant chess games, music performances, film showings and more. Find out what happened at Wonderland Week here.